Hall of Famer Bid McPhee played 2,129 total games at second base for the Cincinnati Reds. He accomplished this playing during all of the Reds' first eighteen seasons as a professional baseball team (1882-'99), acquiring more games at second base than any other player in franchise history. Ron Oester is second on the list playing 1,171 games at the position while Hall of Famer Joe Morgan is third with 1,116. Mario Duncan played 189 games at second base for the Reds during his career and Brandon Phillips has played there 595 times for the Reds going into the 2010 season. Duncan and Phillips have attained 784 combined starts at the position. Mariano Duncan Nalasco was born March 13, 1963 in San Pedro de Macoris, Dominican Republic. Duncan was drafted by the Los Angeles Dodgers as an amateur free agent in 1982. He then played his first three seasons for Dodger affiliates from '82-'84 (Lethbridge Dodgers, Vero Bach Dodgers, and the San Antonio Dodgers). Despite stealing 56 bases for Vero Beach and 41 for San Antonio, Duncan failed to excel in the minor leagues. Duncan's batting average hung around .250 in the minors and he failed to show power or any other tool to compliment his speed. Thanks to injuries in the organization, Duncan received the call from the big league Dodgers to start at second base on Opening Day 1985. As the Dodgers organization was plagued with more injuries in 1985, Duncan was moved to shortstop on June 1, taking over for Dave Anderson. Putting several mediocre minor league seasons behind him, Duncan hit .244 (24 doubles, 6 triples, 6 HR, and 39 RBI) in 1985 helping the Dodgers win the NL West. His 38 stolen bases in 1985 was eighth in the league and Duncan finished third in Rookie of the Year voting. After making terrible music and falling below the expectations he set for himself in '85, Duncan spent the next three seasons ('86-'88) back in the minors. After playing only 49 games for the Dodgers in 1989, Duncan was traded to the Cincinnati Reds with Tim Leary (who would be used later as bait to acquire Hal Morris) for Lenny Harris and Kal Daniels. Mariano Duncan won the starting second baseman job for the Reds in 1990 beating out veteran Ron Oester. Oester was designated to pinch hit and became one of the team's best hitting .299 off the bench in '90. Duncan took full advantage of Manager Lou Piniella's decision and had one his finest professional seasons (offensively and defensively) helping his team win the World Series later that year. In 125 games, mostly batting second, Duncan hit .306 with 22 doubles, 10 home runs, and led the league with 11 triples. Duncan was dismal in the World Series against the Oakland Athletics, but did bat .300 (belting a 3-run homer in game three) during the '90 NLCS assisting the Reds in beating the Pirates. After playing one more year in Cincinnati, Duncan was granted free agency by the Reds after the '91 season. He went on to play for three more teams over the next six years playing for the Phillies, Yankees, and Blue Jays (Duncan also had another stint with the Reds playing 29 games in '95). In 1994 Duncan was selected an All-Star while playing for the Phillies. On December 11, 1995 Duncan signed with the New York Yankees. During the Yankees 1996 season, Duncan had his greatest year as a professional batting .340 and hitting 34 doubles, facilitating the Yankees World Series win over the Atlanta Braves. His corny coined phrase that year "we play today, we win today", became a slogan for the Yankees' season. Many of Duncan's teammates wore the mantra on t-shirts underneath their uniforms daily. After his final MLB season split between New York and Toronto, Duncan played one season for the Yomiuri Giants in 1998. Mariano Duncan is currently the infield coach and first base coach for the Los Angeles Dodgers. Brandon Emil Phillips was born on June 28, 1981 in Raleigh, North Carolina. After signing a letter of intent to play both baseball and football for the University of Georgia, Phillips was drafted by the Montreal Expos during the second round of the 1999 MLB draft. He opted to sign with the Expos on June 21, 1999. Phillips' number (7) is retired in DeKalb County, Georgia where he played baseball and basketball at Redan High School. 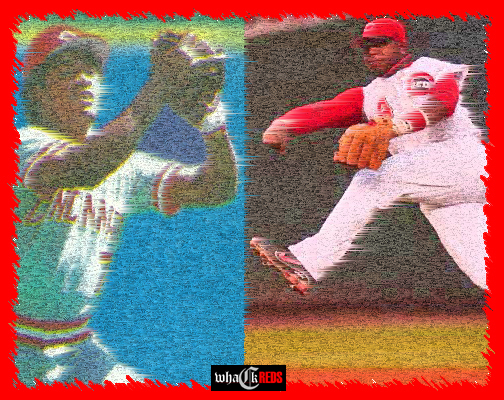 Growing up, Brandon Phillips' favorite baseball player was Reds' shortstop Barry Larkin. For the next four seasons, playing for five minor league teams for the Expos (GCL Expos, Cape Fear, Jupiter, Harrisburg, and Ottawa), Brandon Phillips was considered one of the top prospects in their organization. After three fundamental seasons ('99-'01) in the minors Phillips began to show his worth, climbing the minor league ladder in 2002. With three teams that season, Phillips hit a combined .302 with 18HR, 67RBI, and 14SB. Never reaching the majors with the Expos, Phillips was traded to the Cleveland Indians on June 27, 2002 in a six-player deal involving Grady Sizemore, Cliff Lee, and Bartolo Colon. After playing 55 games for the Indians' affiliate in Buffalo, Phillips was brought to the major leagues on September 13, 2002. In only 11 games during the remainder of the season, Phillips hit .258 with 4RBI in 31AB's; enough to win the starting second baseman job the following year. During his rookie year with the Tribe, Phillips was extremely unstable at the plate. After a 6-game hitting steak and a three run walk-off homerun on May 20 Phillips was sent down to Triple-A in August after an 0-29 stint at the plate. After injuries to the major league club, Phillips was brought back up, and hit .200 finishing the season. At the end of 2002, Phillips played a total of 112 games, hitting .208, with 6HR, 3RBI, and 4SB. Producing poorly at the plate, Phillips totaled a .981 fielding percentage that season with the Indians showing great signs of his defensive superiority to come. 2004 began with Brandon Phillips back in Buffalo playing second base and shortstop. In 135 games he hit .303 with 8HR, 50RBI, and 14SB. Phillips had 16 and 18 game hitting streaks during the season and had a streak of reaching home plate in 51 consecutive games (breaking a Buffalo record). In the playoffs with Buffalo Phillips hit .308 and after the Triple-A season he joined the Tribe for six games. In 22 at-bats he had 4 hits. Phillips' 2005 season was familiar to the previous. He once again began the season in Buffalo, but played worse than he did in '04, diminishing his prospect status for the time being. In 112 games Phillips hit a weak .256 with 15HR and 46RBI. He was called up once during the season for 6 games, but was sent back immediately after going 0-9. On April 7, 2006 the Cleveland Indians could no longer take the frustration of Phillips' inconsistency and traded him to the Cincinnati Reds for a player to be named later (Jeff Stevens). Shuffling players Rich Aurillia, Juan Castro, Ray Olmedo, D'Angelo Jimmenez, Ryan Freel, and Felipe Lopez over the past two seasons at second base; Phillips was given the starting job on Opening Day 2006 and his career as a Cincinnati Red began. Brandon Phillips clutched a second chance in the majors during '06 becoming an instant fan favorite. Phillips led the team in hits during the season (148), multi-hit games (36), and led NL second basemen with 25 steals. He finished his first year with the Reds playing in 149 games with a .276 average, 17HR, and 75RBI. In 2007 Phillips became the first 30-30 (30+ HR and 30+ steals) second baseman in Reds' history (joining only Alfonso Soriano in the second baseman 30-30 club). Joining Barry Larkin and Eric Davis in the Reds' 30-30 club, Phillips also set the single season home run record by a second baseman for the Cincinnati Reds passing Hall of Famer Joe Morgan. Establishing his major league career in 2007, Phillips finished the season with 187H, 107R, 26DB, 6TP, 30HR, 94RBI, 32SB, and a .288 batting average. Realizing Phillips' new worth and avoiding arbitration, the Reds gave him a four-year, $27 million contract extension on February 15, 2008. Brandon Phillips had another fine season in 2008. After controversially getting sparse defensive respect during previous seasons, Phillips was finally rewarded. He won his first NL Gold Glove at second base with a .990 fielding percentage in '08 making only 7 errors in 706 chances. During the regular season Phillips had a 78 game errorless streak. In 2009, Phillips had another great season. Although he has yet to match his '07 year offensively, Phillips consistently plays stellar defense, and puts up the numbers Reds fans have expected of him. He finished '09 batting .276 with 30DB, 20HR, 98RBI, and 25 stolen bases. Brandon Phillips is a well-rounded player who provides the Cincinnati Reds with Gold Glove caliber defense, havoc on the bases, great speed, and an elite hitting ability for his position.